The 2019 Saint Patrick's Day Parade starts at 11am as usual from The Christian Brothers School on Dublin, just past Eddie Rockets and the parade will go down the Main Street and end at Swords Castle. There will be diversions round the Main St. from 6am 'till 4.30 pm. After the parade is over the Main St. will stay closed from Swords Castle to The Malahide Rd. at The Garda Station. The 2018 St. Patrick's Day Parade for Swords will start at the usual time of 11am. The parade will start at the Christian Brothers on the Dublin Road. The Dublin Road and North Street will be closed from 6am until 2pm. Main Street will close from 6am until 4pm. This year's parade [ 2017 ] starts a bit earlier, at 11am from Dublin Road and takes the usual route down Main Street to North Street. Come early to get a good viewing spot as another large turnout is expected. So what else is happening in the town for the 2017 event ? Well after the parade is over there's a fleadh [ Irish Music ] taking place inside the castle, trad. music and a bit of dancing from 1pm 'till 5pm. There's a little fun fair in the council car park at the junction of North St. and Seatown Rd. There's an open air cinema screening of the Jim Sheridan film ''In America'', it's showing on March 16th from 7-30, the film is free but you'll need tickets which can be got at www.usheru.com . Here are the details of the 2015 parade for Swords with the kick off at 11-30 at the top of the town at Christian Brothers School. Please note that there will be no extra bins on the main street for litter, so take it home with you as the small litter bins on the street get filled up fairly quick. After the Swords St. Patrick's day parade there will be a huge party in the main hall at the Fingallians clubhouse. We will have a DJ, Irish dancers and traditional musicians. This event is free of charge and open to all. Review of the 2014 parade. Here are some of the comments that were posted on Facebook when I asked their views of the day. After seeing the main street afterwards was a disgrace rubbish from the top to north street,not enough bins provided. Yes the amount of rubbish thrown around the streets was a poor reflection on the town. There are lessons to be learned from yesterday and one is to provide more bins, [ very large one's ] and perhaps some Council workers would be glad of a bit of overtime cleaning the town after the parade is finished. But the rubbish didn't just come from tin air, a large amount of those attending the parade didn't care where they left their rubbish. Shame on you. Good show and well done, but needs more floats with Patricks day theme such as snakes, giant shamrocks, Celtic crosses, and all things Irish. Was best so far but more floats (art themed) needed maybe dancers music, but was a great day. Great day. Agree that some people will just throw rubbish anywhere, but in fairness there were just not enough bins! People were obviously making an effort as there was rubbish piled up at bin locations. Maybe the food and drink businesses could assist with providing bins seeing as a lot of the rubbish was fast food wrappers etc? Great day out, the weather had a lot to do with...bigger carnival needed....kids loved it...well done to all involved. Great music after the parade, needs to more events like that. The sheer talent in swords when it comes to music! Great day, our kids loved it. If possible needs more music during the parade to create a carnival atmosphere. Thanks to all who organised. well done to all involved in organising the parade . Pity that some people were inconsiderate and threw their rubbish on the ground for someone else to clean. My Own View - It seems like everybody had a great day out. It's one of the few days in the years when the town's people come together in large numbers and that itself is great to see. The Parade itself was pretty much like last year with a lot of sponsored floats, but there would be no parade without these sponsors. If there was a Marching Band taking part it would take the parade to another level, so perhaps this is something to aim for in the coming years. With the parade coming after the Cheltenham festival racing it was the icing on the cake for some businesses in the town with pubs reporting a massive boost in trade for the 17th of March. The publicans I spoke to reported at least a three fold increase in customers. Restaurants and fast food outlets and had a massive increase in sales, evidence of this could be found scattered all over the town. There were chip bags, burger boxes and pizza remains thrown everywhere. This is a problem which will have to be sorted. To try and get 20,000 extra people into a street knowing they will be eating and not provide adequate bins is not acceptable. The bins on main street are not suitable for everyday use never mind for the St. Patrick's Day Parade. Several 40 gallon drums placed every 50 meters would do the job. 2014. Above is the events taking place for the 2014 Parade in Swords. Basically it's the same as the last couple of years with the parade starting at the Christian Brothers School at 12 noon. It's expected that 20,000 people will line the streets to watch the 2,000 people taking part in the parade this year.. Michael Dawson will be the Grand Marshall this year. Michael is the founder of one4all who are based in Swords and who sponsor this years parade. This year sees a name change for the event which will no longer be officially called The Swords Parade but instead called The Fingal St. Patrick's Day Parade instead. According to Fingal County Council Events Department who help organise the event, they see the parade as a ''Fingal'' rather that a Swords event. There will be street entertainment from 11am on the main street. The parade starts at 12noon from the top of the town. There's a fun fair taking place on Seatown Road for the whole long weekend. St. Patrick's Day is the busiest day of the year for the pubs and restaurants in the town. 2013 will see another parade for the town of Swords. The parade will start at 12 noon at Dublin Road and head down the Main Street and on to North Street. There will be pre-parade entertainment from 11am. Ceile Mor will preform on Main Street after the parade at 1.30 pm with traditional music and dancing. Swords Viking Village Festival And Market will take place on Saturday the 16th from 11am to 6pm and Sunday 17 March 1pm to 6pm featuring combat display, archery and armoury, viking kitchen, blacksmith, scrimshaw and woodwork demonstrations. The usual road closures will take place during the main parade, Dublin Rd, Main Street, Bridge Street, Chaple Lane and North Street. Irish music in Pubs on St. Patrick's Day In Swords. There's a trad. session in the Star pub from 7pm 'till 9pm and before that Celtic Fusion play. The traditional session is a mix of tunes for the most part with a few songs thrown in. Celtic Fusion play a mix of Irish folk and American pop and folk. But I'm sure there will be more of the Irish stuff because of the day that's in it. Down in The Estuary there's a ballad session with The Fingal Brigade playing un-plugged. They play mostly old folk and Irish rebel songs. It starts at about 9pm 'till late as there's a bar extention and the next day is a bank holiday. 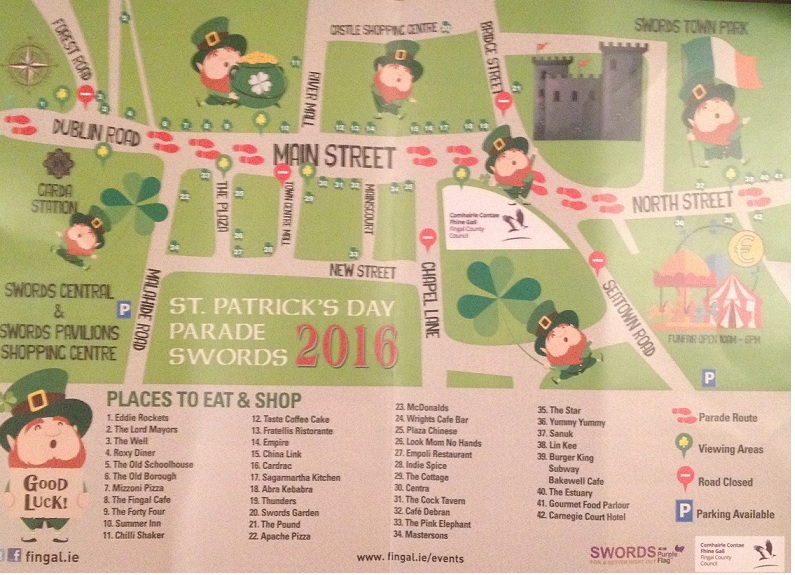 So you have no excuse for getting out and having the craic this St. Patrick's Day in Swords. Swords Carnival / Fun Fair. The Carnival is back in Swords beside the Pavilions. It starts on Friday 15th until Sunday 24th March. The Saint Patrick's Day Parade And Carnival In Swords.2012 This year's parade will start at the Christian Brothers School at the top of the town at 12 noon. Come early to get a good viewing spot. As you can see from the photos. below the town gets very packed. Main St. and North St. will close at 10-30am. First to lead the parade will be the local branch of R.D.F. which was formally known as The F.C.A. Up to 40 other groups will follow them down the main street which will include the Swords Cricket Team, Swords Boxing Club, The Girl Guides, Kinsealy Boys F.C. and many more. As of last year there will be street clowns, face painting. A total of 1200 adults and children will be involved. 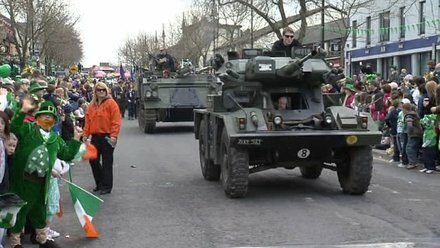 Up to 20,000 people were in attendance at this year's parade in Swords. Among the dignitaries on the viewing stand were The Minister For Health James Reilly T.D the Socialest party T.D. for Swords Clare Daly, Dublin North T.D. Brendan Ryan along with several members of Fingal County Council and guests. The parade of floats began at the top of the town at the Christian Brothers school and made it's way down Main Street stopping at County Hall to be reviewed by the guests of honour. There were about 30 floats ranging from old milatary vihicles including a tank to the local G.A.A. and scoccer clubs including Fingallians and St. Finians. Some local tallent in the form of Hip Hop dancers were included alongside members of Irish dancing school. The parade lasted just over an hour, The Main Street was back in order after the big clean up. There were plenty of stewards on hand along with members of the Garda and the parade passed of without incident. As many regular visitors to the site will already know I give an honest opinion on things and say it the way I see it. The parade is no exception to that rule. Way too many commerical floats with anything from car insurance to loosing weight being advertised. Some [not all] of these commerical floats,well if you could even call them floats, floats which consist of a car or van with advertising painted do sponsor local groups in the town. But that shouldn't be a reason to allow them take part. The St. Patrick's Day parade will recommence in Swords after an absense of more than twenty years. This year's parade  will start at The Pavilions Shopping Centre on March 17th 12-30 and make it's way along the Malahide Road to Main Street and then turn right at the castle down North Street. A viewers stand will be erected on Chaple Lane beside The Star Pub. The Main Street, Chaple Lane and North Street will close around 11am and will re[open in the afternoon when the parade is over. Music will be provided by The Seamus Ennis Center the Naul, also taking part in the parade will be the local F.C.A. ,The Civil Defence, Irish Girl Guides, The Swords Vintage Club, Irish Military Vehicles. Also on Main Street there will be clowns, face painters and stilt walkers. Some pubs in Swords will also host live music, The Star Lounge have Celtic Fusion in the lounge. Traditional music will also take place on the Main Street. This year's parade is sponcered by Le Cheile, Fingal County Council, Fingal Dublin Chamber, Pavilions Shopping Centre, Swords Lions Club, Dublin Airport and Swords Community Council. The parade in Swords was a hugh success with several thousand in attendence. The fine bright sunny weather helped bring the attendence numbers up. Business in the town was also booming with all the pubs and restaurands reporting profits way up. The last St. Patrick's Day parade that was held in Swords was 1987. The sponsers of this year's event should be very proud as everybody enjoyed the day, lets hope there are many more to come. The only negative comments were the litter that was all over the street until the next day as no council staff were working to clean it up after the parade had ended, another point is ''why were so many people littering the town in the first place''.The other gripe people had was the amount of commercial business floats and vehicles taking part. The drinking of alcohol is strickly forbidden in public places. This law will be strickly enforced by Swords Garda. Be proud of your town. Keep Swords Tidy.